Welcome to Diversity Dance! We can't wait to share our love of dance with your family! When we receive your registration, your $20 registration fee (per student) will be processed on the payment method provided. Session classes (8-12 week programs) are not charged a registration fee. If you have any questions, please contact our office, we are always happy to help! Please click below to enrol! **If you aren't able to find the class you are looking for, please leave the class selection blank, then complete and submit the form. We will be in touch and happy to help enrol your dancer in the classes of your choosing. ** Please use the comment box to let us know of any previous dance experience, placement questions or if you do not see the class you are looking for. The full school term consists of a minimum of 35 classes and runs from September - June. The studio follows the public school calendar. The studio will closed on Thanksgiving Monday, Halloween (pm only), Remembrance Day (am only), Winter Break, Family Day Monday, Spring Break (including Good Friday) and May Long Weekend. We will be open on Teacher's Conventions. Diversity is not able to put a hold on tuition for vacations. Make up classes till Winter Break will be provided if any classes are missed, please speak with the office to schedule a make up class. No refunds will be given for missed classes. If the teacher cancels a class, it will be rescheduled. No refunds will be given for missed classes. Diversity is not able to put a hold on tuition for vacations. Make up classes till Winter Break will be provided if any classes are missed, please speak with the office to schedule a make up class. If the teacher cancels a class, it will be rescheduled. A non-refundable charge of $20.00 per student (including GST) must accompany this registration form for all full year classes. This fee holds your child's space in a specific class or classes. This registration fee is to cover administrative expenses for your account throughout the year. * Session Classes ie: Adult classes, Small & Tall classes, Summer Camp or ½ Day Camps are not charged the $20.00 registration fee. You will see this fee automatically posted to your account, but it will be deleted before your session payment is charged* Diversity Dance and Performing Arts holds the right to reschedule or cancel a class when 6 or fewer students are registered. Tuition and registration fees do not include footwear, dancewear, recital costumes and recital tickets. These are additional costs. Payments returned NSF, account closed, etc must be honored and a $20.00 fee will be added to the amount owing. Students will not be allowed to attend class if they have outstanding or overdue accounts. Notification via email must be sent one month in advance of a student withdrawing from classes. One month after written notification is received, the monthly payments will stop. If a full year payment has been made, a refund cheque will be issued. We will not refund partial month payments. Withdrawal notices must be received by the 15th day of the month or your next months payment will go through. 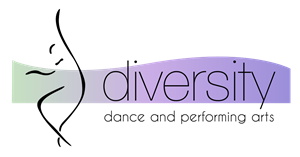 Diversity Dance and Performing Arts Inc, the studio owner or teachers will not be held responsible for any accident or injury that may occur on the way to, from, or in the studio, or any activities that take place outside the studio. Diversity Dance and Performing Arts Inc is not responsible for any items lost or stolen. Valuable items may accompany the student into the dance studio if necessary. I hereby grant Diversity Dance and Performing Arts permission to use and reproduce my likeness in print, video or electronic format for any lawful purpose, including website entries, social media and any printed materials, without payment, compensation, or any other consideration. I understand and agree that these materials are property of Diversity Dance. In addition, I wave the right to inspect or approve the finished product, including written or electronic copy, wherein my likeness appears. I hereby hold harmless and release and forever discharge Diversity, or any other persons acting on behalf of Diversity, from all claims, demands, and causes of action which I may have by reason of this authorization. *IF YOU DISAGREE PLEASE CONTACT US! We respect your dancers privacy and can ensure their photo is not released.